4 Bedroom Terraced House For Sale in Wincanton for Asking Price £260,000. 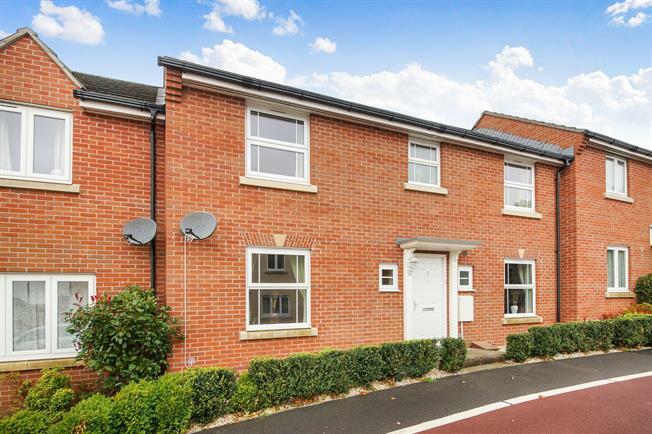 An immaculately presented, four bedroom terraced property, situated within a highly desirable new development in Wincanton. The property offers spacious accommodation within a contemporary layout, that comprises: light and airy living room, dining room, modern kitchen with utility area, four good sized bedrooms with an en suite to the master and a bathroom. The property also enjoys added benefits including a sunny aspect rear garden, a garage with parking in front, gas central heating and the remainder of the NHBC certificate. Entered via part glazed wooden door, under stairs storage cupboard, radiator, and doors to kitchen, living room, dining room and WC respectively. With white ceramic pedestal wash hand basin, low level WC and obscured double glazed window. Light and airy room, with double glazed window to front, two radiators and French doors leading out to the rear garden. With double glazed window to front and radiator below. Presented with a range of wall mounted and base units with rolled edged work surfaces over and stylish dark laminate flooring. Stainless steel sink and drainer, integrated dishwasher, 'Electrolux' oven integrated into high level unit and separate four burner gas hob. Double glazed window to rear and radiator. There is also a utility area with base units with space for a washing machine, stainless steel sink and drainer, radiator and door to rear garden. With airing cupboard housing water tank and associated shelving. Loft hatch access and radiator. A modern suite comprising Walk in shower with sliding door, low level WC and white ceramic wash hand basin with wooden storage unit below. Obscured double glazed window to rear and radiator. Built in wardrobe with sliding doors, double glazed window to rear and radiator. Double glazed window to front with radiator below. Built in wardrobe with sliding doors, double glazed window to front and radiator. Presented with laminate flooring and neutral tiling throughout. With modern suite comprising Panelled bath with shower over, low level WC and pedestal wash hand basin. Obscured window to front and radiator. With an initial patio area, leading to section laid to lawn, separated by pathway. Enclosed entirely by timber fencing, and a gate to path which in turn leads to the garage.